Thank you for registering to attend the Mercy Mats project. Feel free to bring any clean plastic bags you may have from the grocery store/Target, etc. so we can reuse them, but Mercy Mats will bring bags as well. Please enter one registration for your entire family but note how many will be attending. 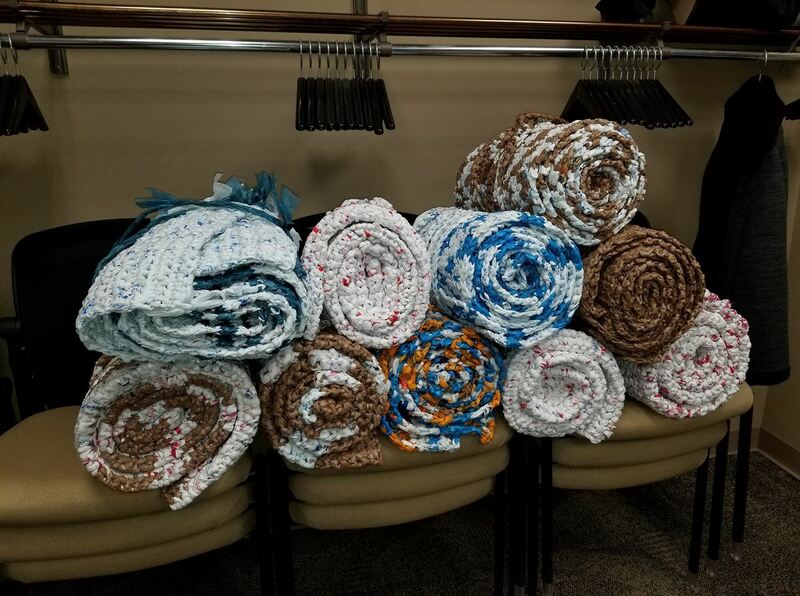 On Wednesday 4/17 we will be joining the Mercy Mats volunteers at their regular weekly project at the West Allis Library to prepare materials for sleeping mats for local homeless people, made out of plastic bags. Volunteers from Mercy Mats of West Allis will help us learn how to do this project and then they will later distribute the bags to a homeless shelter they work with in Milwaukee. There is a job for everyone, including sorting bags, flattening bags, making plarn (you got it, plastic yard made from the plastic bags!) and then crocheting the plarn into the mats. Making one mat is quite labor intensive, but what a difference a mat makes to the person who will receive it! You can check on the Mercy Mats West Allis Facebook page for more info on their weekly Wednesday projects (all are welcome, just send them a message!) as well as pictures of past recipients. Open to members of all ages. Because we are joining the Mercy Mats project at their site, we need to limit the number to 6-8 families. You do not need to stay the entire time, but please plan to stay for at least an hour to maximize the amount we can contribute to their efforts.